Sure, we would love to do that! 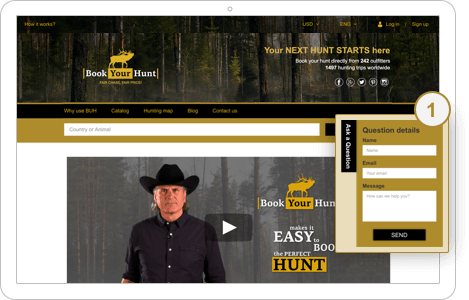 First of all, If you want to have a bit of fun and at the same time get an idea on how search results filters work, we recommend you to have a look at Jim Shockey’s tutorials. 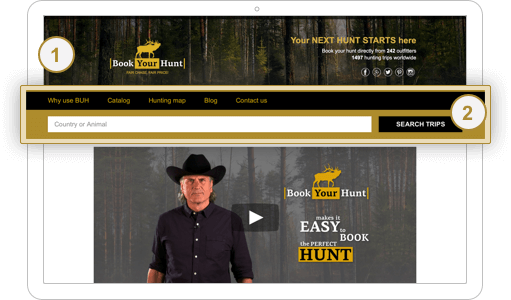 In these tutorials Jim proves that even seasoned old-schooled hunters can easily figure out how to use our website! Catalog is a very handy tool to slice offers in many different ways. 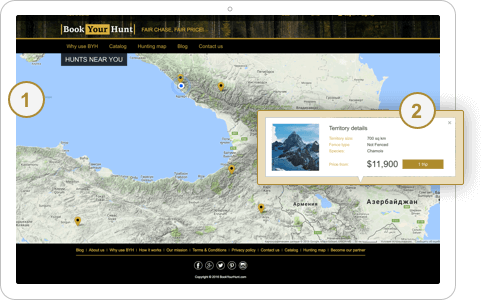 Have a look at the search bar, search results filters, the catalog menu and the hunting map. Please visit a desktop version of the FAQ page to get more details. What type of offers do you have on your site? You can find 2 types of offers on our website: non-package and package offers. How to understand whether a certain offer is a package or non-package one? It's simple! We have 2 types of offers: non-package offers and package offers. What is the difference between non-package and package hunts? 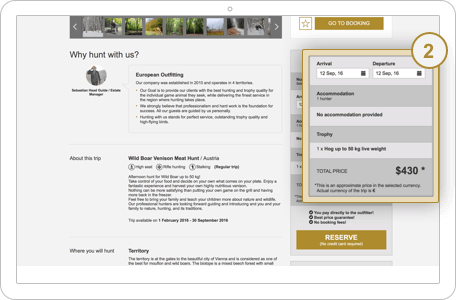 Non-package hunts give a hunter more flexibility: you can select not only dates of your hunt, but also number of hunters, guests, species, accommodation and sometimes even additional services. Our system will calculate a new price on the fly. These type of offers are quite popular in Europe and Africa. 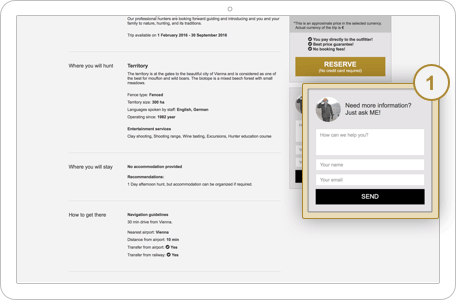 1 Enter all your information in the booking form and have a look at the final price. Some other regions (e.g. the United States) prefer to package offers. 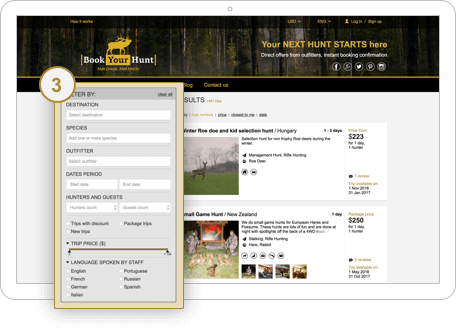 A package hunt usually has a fixed number of hunters and services (accommodation, species, etc). 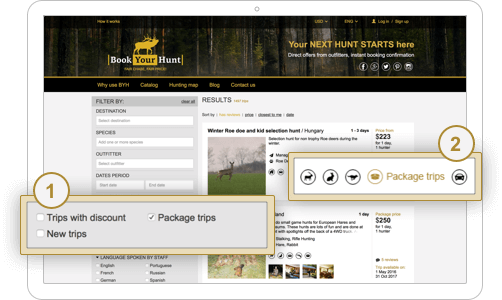 Non-package trips give a hunter more flexibility whereas package trips has a fixed price with no surprises. Can I talk directly to an outfitter on your platform? How can I be sure that I am talking to a real person? Yes, you can, this is the core idea behind our project. 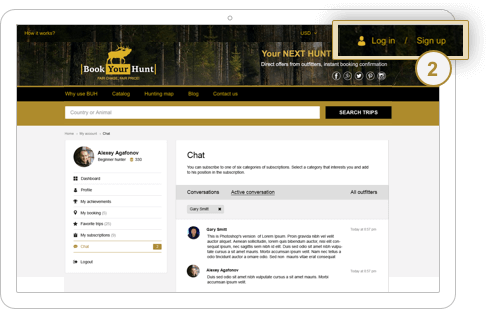 You can always get in touch directly with any outfitter. Yes, you can, this is the core idea behind our project. 2 Or just sign up and send us a message via chat. Just ask our friendly staff! 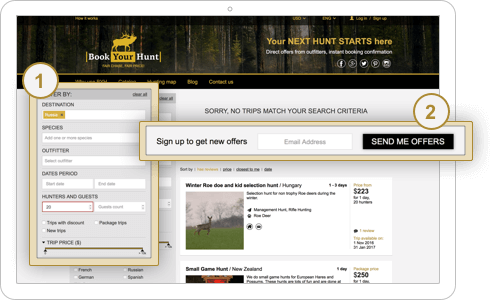 Subscribe to get offers matching your search once we get them.